First aid to help prevent infection and provide temporary relief of pain or discomfort in minor: cuts; scrapes; burns. 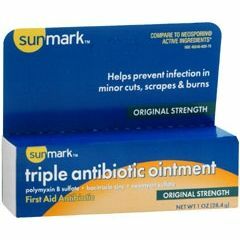 AllegroMedical.com presents The sunmark Triple Antibiotic Ointment. sunmark Triple Antibiotic Ointment. 1 oz. First aid to help prevent infection and provide temporary relief of pain or discomfort in minor: cuts; scrapes; burns. Compares to Neosporin ointment. Not made with natural rubber latex. Packaged: 36 Per Case. Neosporin is a registered trademark of Pfizer Inc.